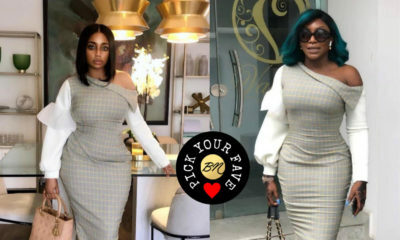 Today’s BN Pick Your Fave features a renowned author, Chimamanda Ngozi Adichie and media personality, Bolanle Olukanni both in this dress by Style Temple. 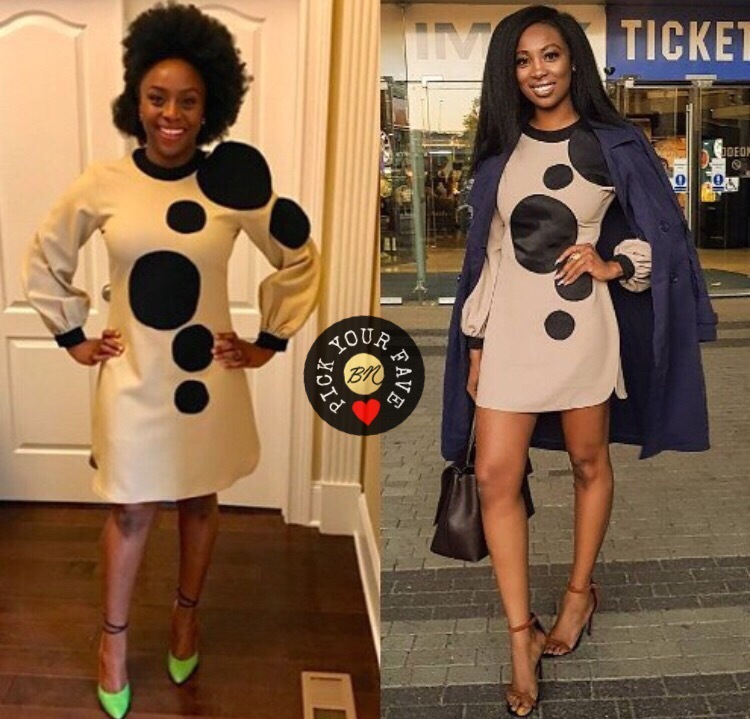 Chimamanda wore her’s with green heels as part of her ‘Wear Nigerian’ campaign while Bolanle wore the same dress in London for the premiere of new movie, Isoken – hence the jacket. Who is your fave? Love Chimamanda but prefer this dress on Bolanle Olukanni,the Ijesa girl !! It looks better on bolanle. Chimamamda what were you thinking when u wore those green shoes. I love Chimamanda green shoe. 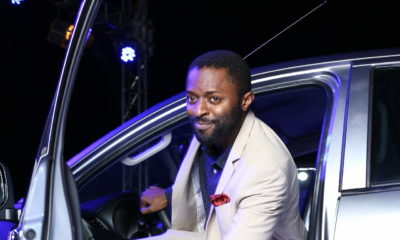 Love both sisters, but it is Chimamanda for me men!. She is a cool customer and an intellect. Is she still single? When you have a daughter you’ll tell me what’s stupid about letting her be the best she can be. Women can’t even walk out of their homes without a man in some parts of this country. Girls younger than 19 are being married to pedophiles 2-4 their age in this country, >40, and you are busy saying stupid feminists No you know what’s stupid thinking that having a womb to continue your people makes a woman the “lesser” gender that need to be policed, disgraced on the streets, not allowed to enjoy teenage years and develop normally by men whose seed they help nourish and multiply is right and women asking for rights, education, and independence from oppression are stupid. We can survive like ants bees do you know all we need is one sperm donor but can’t say the same other way round. @Paul you must be a wife beater! Are you so insecure? Seek help bro! Am sure he won’t mind his daughter being a doormat for a man to walk all over her.. While trying to defend women, you are also sounding sexist. What’s the talk about ‘all we need is ……., can’t say the same about ………’. Attack the Paul guy and educate him abit but leave the shade out of it. Does it look good if I say all a man needs is an egg donor and a surrogate mom. Truth is when you argue like this, you make it look like God made a mistake but He didn’t. Men need women just as much as women need men. No one needs the other more. I actually prefer it on chimamanda I love her shoes. I’m not Igbo so this comment isn’t based on sentiments. 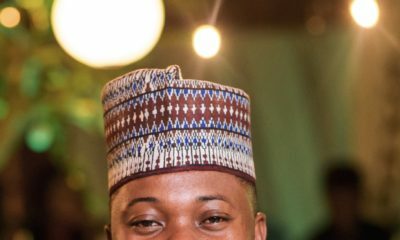 Wear Nigerian, One Nigeria. What has being Igbo got to do with this? What a country! I don’t like both their hairstyle so none of them for me. Bolanle clearly wore it better. Is Bolanle single? Beautiful lady. Nice smile. I love Chimamandas hair, the dress suits her more for me but Bolas sandal is better. Bolanle’s legs look like Turkey legs? Let’s see your legs, probably looks like dry fish. I like both CNA kept it classy, Bolanle added some hot spice to it. Pretty legs. These “who wore it better?” comparisons can really be damaging. It is quite possible for 2 or more people to wear the same outfit and wear it well in there own way. There is absolutely no reason to line them up next to each other and encouraging people to grade them. Is this a fashion world thing I cannot seem to grasp? There is just something utterly degrading about this practice. That 2 absolutely amazing women wore the same thing is/should not be an article. That others so it, does not mean you should. I see BN as a trailblazer in this industry and you can create new ways of thinking about these sort of things. You may think, “it’s not that serious” but do take a look at comments above. What exactly are people grading on? How is this edifying to the 2 people featured? What is the purpose? Click bait? Then you just like the rest of them. P.S. It’s quite alright for you not to post this (I’ll actually prefer you did not) as long as someone in your office reads this and actually think about it.